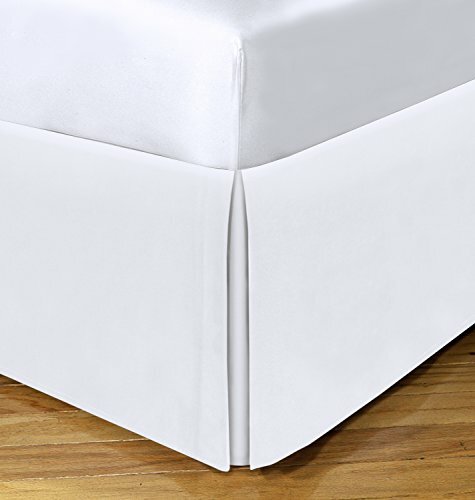 PREMIUM EXTRA LONG BED SKIRT - This bed skirt measures 21 inches and is the perfect size to cover the gap your bed riser creates and also your box spring. It creates a beautiful, seamless look. HIDES STORAGE UNDER THE BED - Bed risers are great at creating extra storage under the bed. Having to see boxes and bags that you have stored under the bed is not a good look. Fix that issue with this premium bed skirt! COVER THAT UGLY BOX SPRING - Box springs give your bed some extra height and helps extend the life of your mattress. They can be unsightly to look at. This bedskirt completely covers your box spring. TOP QUALITY MATERIAL - It is made from 100% Polyester. You will notice right away that this is no ordinary bed skirt. It looks and feels like no other. Don't settle for cheaper alternatives. MACHINE WASHABLE - The material is ultra durable and will hold up very well in the washing machine. Machine wash on warm with similar colors and tumble dry on low.